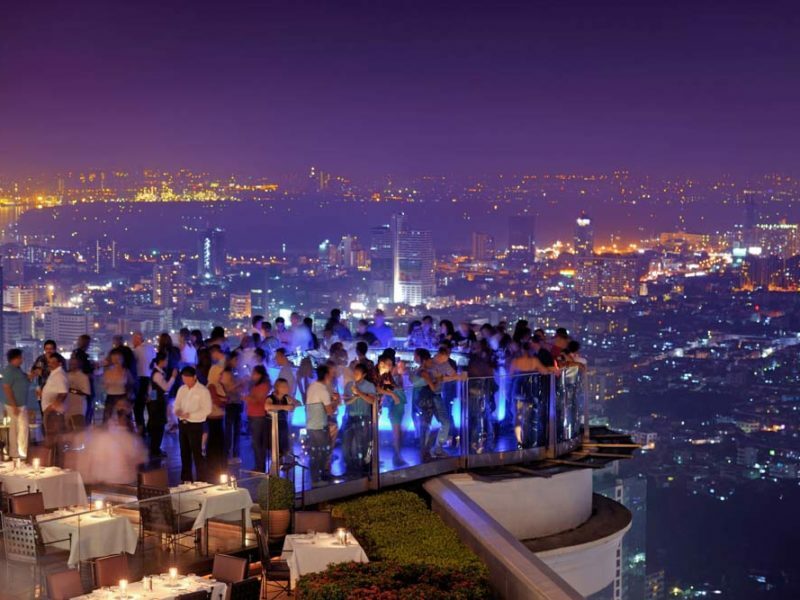 Patrons of Bangkok's Sky Bar, enjoying drinks with a view. Sipping a cocktail in a rooftop bar suspended high in the open-air is surreal and magical. These five Bangkok bars, perched at dizzying heights above the city, will spice up your night life. 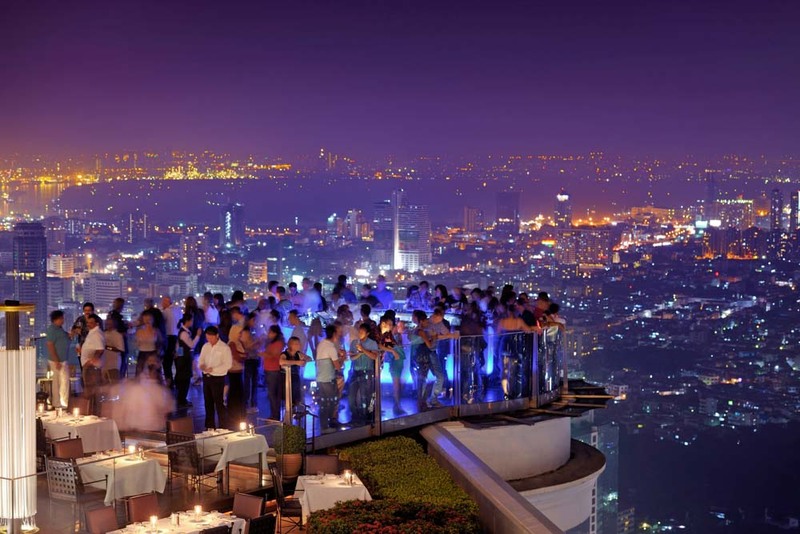 Considered one of the highest rooftop bars in the world, Sky Bar has spectacular views of the Bangkok skyline. In summer, grab a Poptail; a cocktail and popsical creation that’ll cool you down in no time. Spectacular view of Bangkok from Vertigo & Moon Bar, Banyan Tree. Vertigo & Moon Bar is an al fresco grill and bar located on the 61st floor of the Bayan Tree Hotel & Resort. Order a Vertigo Sunset; a Malibu, cranberry, pineapple and lime creation, it’s perfect for sipping on while contemplating the city-lights. Watch a sunset from the rooftop bar Above Eleven of the Fraser Suites. Bangkok, Thailand. Inspired by Peruvian and Japanese Cuisine, the food at Above Eleven is served tapas style, this makes it perfect for sharing with friends. Adding to the fun factor is the maze at the entrance, walk through this to get to panoramic views of Bangkok. Rooftop views fom Park Society, So Sofitel, Bangkok. For an glitzy dining experience with fantastic views, head to Park Society. The food offering here is top-notch modern Western Cuisine. Looking for a touch of romance? grab a cocktail and head to the terrace to watch the sunset. Located on the 25th floor of Hotel Muse in Bangkok, this bar offers numerous chill out areas. Not quite as high as the other offerings, but this cool rooftop bar covers two floors with numerous areas to chill out in. Channel a bit of vintage-glamour and order a martini to enjoy while listening to some smooth tunes.